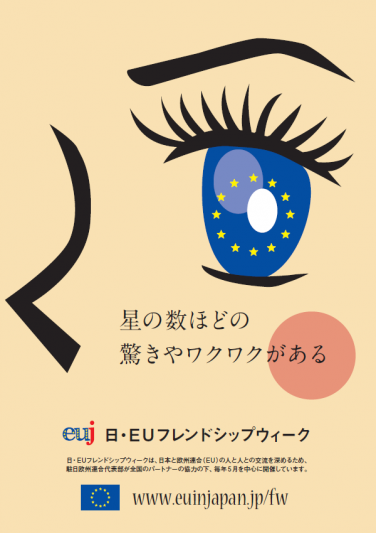 The EU-Japan Friendship Week first started in 2001 as a programme of events lasting for a number of weeks, focusing on public diplomacy, academic and cultural activities. Since then it has grown into a comprehensive schedule of such events taking place throughout May, June and part of July, both in Tokyo and in Japan's regions. The aim of Friendship Week is to give the Japanese public a chance to learn more about the EU, its relations with Japan and Europe's history and diversity. To that end, the EU Delegation organises selected events and activities and sponsors or encourages many others. Traditionally, Friendship Week kicks off with the celebration of Europe Day on 9 May, with numerous interesting, informative and entertaining activities following in the weeks thereafter.